The Italy EDC will have their regular monthly meeting on Monday, June 4, 2012. The meeting will be held in the Italy City Council Chambers at 105 West Main Street and is slated to begin at 6:00pm. Discuss and consider necessary action(s) regarding property across from City Hall. Discuss and consider necessary action(s) regarding real property inside the Boze Community Center. 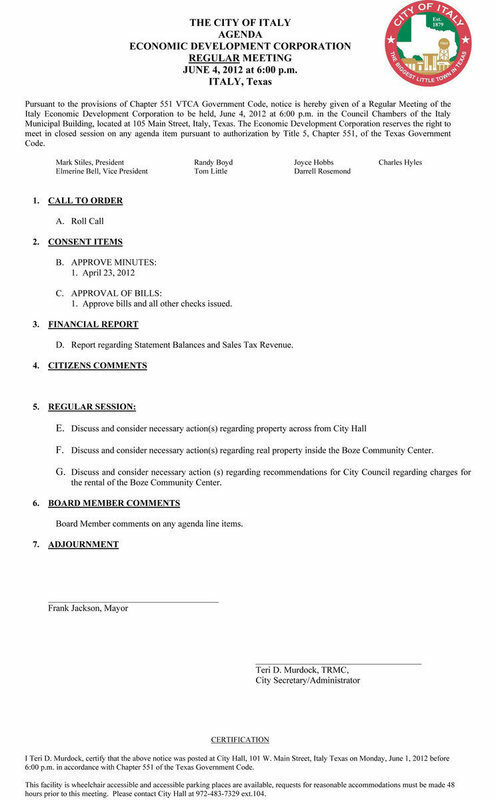 Discuss and consider necessary action(s) regarding recommendations for City Council regarding charges for the rental of the Boze Community Center.